So says Ai Weiwei, China’s premier artist, in Ai Weiwei: Never Sorry, a documentary which was released late last month. In recent years, Ai has been the most prominent critic of his government’s repression and lack of transparency. After authorities covered up the identities of many victims of the 2008 Sichuan earthquake, whose death toll of 70,000 was amplified by the province's shoddily and corruptly built public facilities (including schools), Ai unearthed more than 5,000 of the names of the lost and sustained a police beating that left him with internal bleeding in his head. Last year, the government detained him without charges at an undisclosed location for 81 days. In other words, while Ai and Bo might make for an interesting comparison—both, for example, had fathers who were initially revered by Mao and his minions but later served hard time for betraying the revolution—they aren’t exactly kindred spirits. Not only is China governed by men, not laws, but because those men are abusing the laws as cover for their agenda, any future introduction of a genuine rule of law is bound to be greeted with skepticism by the Chinese people. 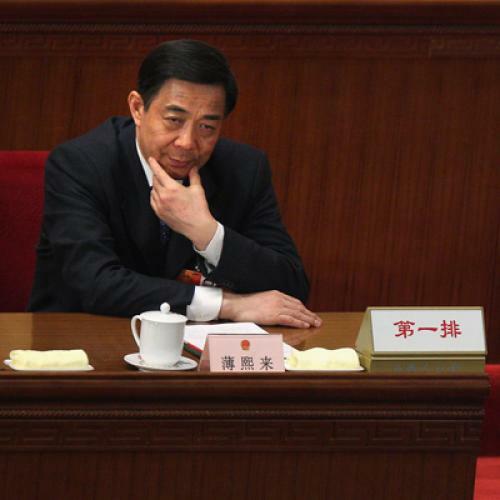 “Even today, there is really no one who knows what has happened to Bo Xilai,” Ai observed. The same could be said of Wang, who is sitting somewhere in Chinese custody, presumably awaiting trial; of French architect Patrick Devillers, apparently Gu’s onetime lover, who, depending on which source you believe, has either been “arrested” or “housed” in China; and of Gu, whose closed trial will reportedly begin this week (British diplomats will likely be permitted to observe). The one thing we do know is the rough outcome of Gu's trial: in the course of announcing it, the state news agency Xinhua “reported” that the evidence against her is “irrefutable and substantial,” and that the extremely wealthy defendant had accepted a state-appointed attorney. Why aren’t we paying more attention stateside? Even if we're not hanging on Ai's every word, as we may have of a Solzhenitsyn, why aren't we more aware of the Bo saga, which is quite possibly China's most consequential political development in two decades? It makes sense that the FT is lending it extra coverage, since the only murder victim that we know about was British; but it's regrettable that no American outlet that I could find has picked up Ai’s fascinating (and also totally logical) thoughts on Bo. At one point in Ai Weiwei: Never Sorry, Ai remarks, “If the government was afraid of someone, it wouldn’t be the government anymore.” I’m an extremely amateur China-watcher, but it seems to me that China’s government is far more scared of outside disapproval than internal dissent. We have our work cut out for us.